Same superb ease of use as the non-abrasive pink pre-wax cleanser, but with added medium grade diminishing abrasives for easy removal of light swirls and surface scratches by hand or DA. Regarded as providing similar cut to Menzerna 85RE. Brilliant at removing slight defects. Need a pre wax cleanser that's versatile enough to remove minor marks and slight scuffs or blemishes? You've just found it. Best used with a microfiber applicator there's just enough cut to remove ingrained dirt or bug remains without being overly aggressive with your paint. 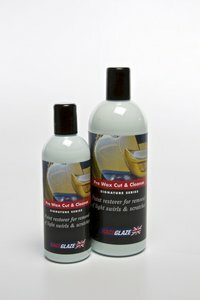 Very quick and easy solution to getting your car ready for the wax stage. "Thank you so much for such a quick and more than satisfactory response... If only all customer service departments were so helpful. Thank you very much."